That's right - I said, "Embracing Insecurity." I once had a spiritual teacher who suggested something that I found to be quite odd. I told her that I felt really "dark" one particular day. It was completely out of character for me, and it scared me. "Why does it scare you?" she asked, "Everyone experiences anger. Why don't you Embrace it?" I really had no idea what she was talking about. "You mean, maybe do something artistic with big, violent black swirls across the paper? What do you mean, embrace the anger? I have shame around the anger. Anger is a bad thing. I don't want to be angry. I don't want to express the anger. I just want it to go away." "The only way it will go away is if you meet it face-to-face. Ask it why it's here and what it needs. Love it, and then free it to be on its way. If you run from it, it will only continue to return and leaving you feeling uncomfortable." This made sense. She went on, "Why don't you completely embrace it by doing what I've suggested, and to top it all off, dress in grungy 1990s clothes - maybe in all black or dark plaid. Wear dark makeup, and give off a little 'tude. Just for a day - embrace the anger." What I put together was a black and white button down, long sleeved shirt, a black skirt, black nylons, and yes, black shoes. I did my eye make up a bit more heavy and wore a slightly darker lipstick that I usually do. I didn't want to go full-force gothic, as I did not want to be hauled away as an insane person - the flip would have been way too much for all of those PsyD's and MSWs. I got to work and felt a growl in my throat and a heaviness in my step. I asked anger why it was here and what it needed. And, you know what? It just needed to be acknowledged, accepted, and released. I walked around that day at work and actually got compliments on my "edgy" outfit and told that I look really great in dark eye makeup. It was the oddest thing ever. The side of me that terrified me so...the side that I did not even want to acknowledge, let alone embrace, was just a normal, human experience that others could see and identify with. 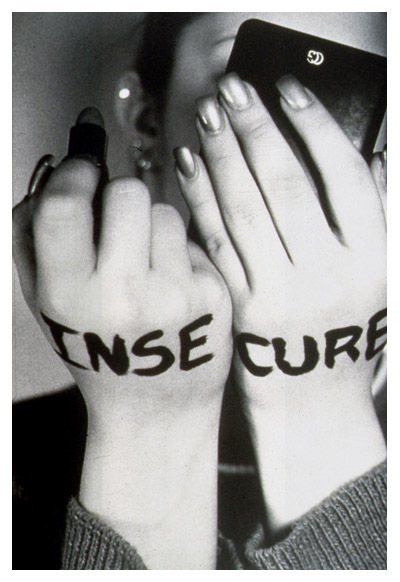 These days, it's insecurity that has been coming up, and I've been trying to ignore it. As I sat down to think about how I would approach insecurity in this blog post, the story of my spiritual teacher and the conversation about Embracing Anger came to mind. And, I'm glad it did...because tomorrow I am going to get up and Embrace the Insecurity. I'll let you know how that goes. Theater of the Mind, Starring: "ME"
How I'm Dealing with my "Hang Over"
What part of you are you feeding? No Savasana? How about Breakfast for Dinner?